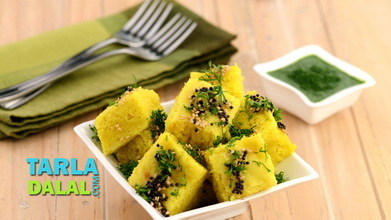 Dal dhokli is a sunday morning delight in most traditional gujarati households! 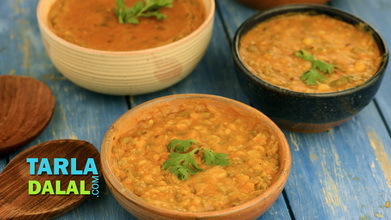 a perfect combination of spiced whole wheat flour dhoklis simmered in Gujarati dal, this can be classified as a sumptuous one-dish meal, but you could also serve it with rice to make it all the more tasty and wholesome. 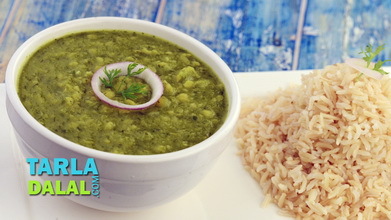 Just remember to simmer the dhokli in dal just before serving, or else it will turn soggy. Cover the dough with a lid and keep aside for atleast 15 minutes. Divide the dough into 5 equal portions and roll out each portion into a 200 mm. (8”) diameter thin circle using a little whole wheat flour for rolling. 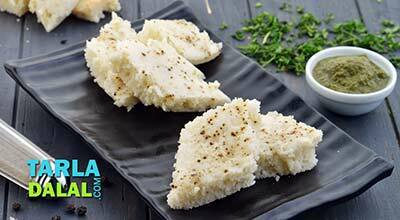 Heat a non-stick tava (griddle) and cook each chapati lightly from both the sides. 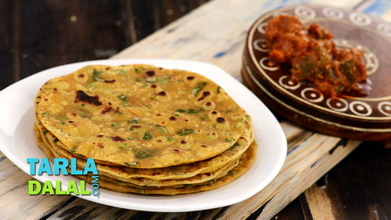 Cool and cut each chapati into diamond or square shapes and keep aside. Clean, wash and drain the dal. 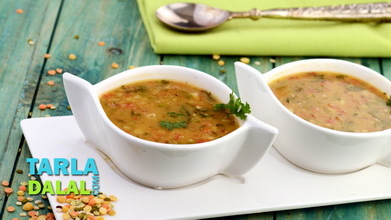 Combine the dal and 2 cups of hot water in a pressure cooker and pressure cook for 3 whistles. 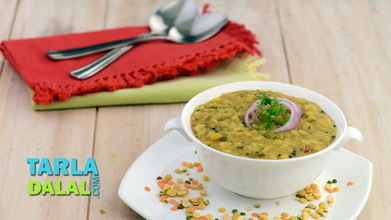 Combine the cooked dal and 1 cup of hot water in a deep non-stick pan and blend it well using a hand blender till smooth. Add more 2½ cups of hot water and mix very well. Place the deep non-stick pan on the flame , add the salt, kokum, lemon juice, jaggery, ginger-green chilli paste, chilli powder, cashewnuts, curry leaves and turmeric powder, mix well and cook on a medium flame for 10 to 15 minutes, while stirirng occasionally. Meanwhile, for the tempering, heat the ghee and oil in a small non-stick pan, add the cumin seeds and mustard seeds and allow them to crackle. When the seeds crackle, add the asafoetida, red chillies, cinnamon, cloves and sauté on a medium flame for 30 seconds. Add this tempering to the dal, mix well and cook on a medium flame for 2 to 3 minutes, while stirirng occasionally. Keep aside. 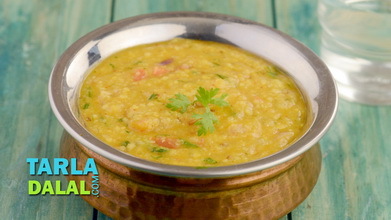 Just before serving, boil the dal, once it starts boiling, add the dhoklis, coriander and ghee, mix well and cook on a medium flame for 1 to 2 minutes, while stirring occasionally. 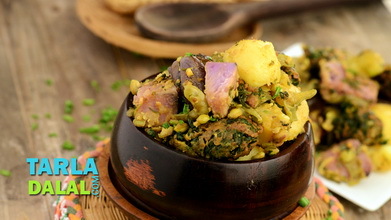 Add the dhoklis one by one into the dal, otherwise they could coagulate to form one big lump.